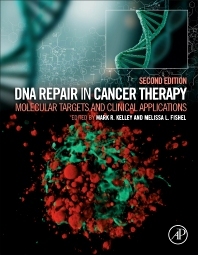 DNA Repair and Cancer Therapy: Molecular Targets and Clinical Applications, Second Edition provides a comprehensive and timely reference that focuses on the translational and clinical use of DNA repair as a target area for the development of diagnostic biomarkers and the enhancement of cancer treatment. Experts on DNA repair proteins from all areas of cancer biology research take readers from bench research to new therapeutic approaches. This book provides a detailed discussion of combination therapies, in other words, how the inhibition of repair pathways can be coupled with chemotherapy, radiation, or DNA damaging drugs. Newer areas in this edition include the role of DNA repair in chemotherapy induced peripheral neuropathy, radiation DNA damage, Fanconi anemia cross-link repair, translesion DNA polymerases, BRCA1-BRCA2 pathway for HR and synthetic lethality, and mechanisms of resistance to clinical PARP inhibitors. What Does Ubiquitination Do To FANCD2 and FANCI? Mark R. Kelley, PhD is currently the Betty and Earl Herr Chair in Pediatric Oncology Research, Associate Director for the Herman B Wells Center for Pediatric Research, and the Associate Director of Basic Science Research at the IU Simon Cancer Center. Dr. Kelley’s laboratory studies DNA base excision repair in normal and tumor cells, including the study of DNA repair genes in cognitive dysfunction and peripheral neuropathy. He holds 10 patents related to the use of DNA repair targets for cancer therapy and serves on the consulting and scientific boards of several companies. Thus far Dr. Kelley’s research resulted in over 160 articles published in peer reviewed journals along with numerous reviews and book chapters. Dr. Fishel is a DNA repair expert who is highly published and is at the forefront in the development of new tumor models focusing on DNA repair pathways in cancer.